Transport to Tuscany in this intriguing love story. Mrs Gracie Burton is a shy, quiet 68 year old widow living in the refined little town of Badley Compton, presided over by snobby Flappy Scott-Booth and her coterie of middle-aged friends. Where Flappy leads the women follow – so Flappy is outraged when Gracie announces, without consultation, that she is off to Italy for a week, to attend a cookery school at Castello Montefosco in Tuscany. No less surprised is Gracie’s daughter Carina, a high-flying executive in London. She hasn’t spoken to her mother for months. A vague sense of guilt allows her to give in to her husband Rufus’s persuasion to go with Gracie to Italy. Their teenage daughter Anastasia, Gracie’s granddaughter, makes the party up to three. It’s an ideal opportunity for three generations to bond, and certainly Mamma Bernadetta’s cookery lessons are designed to relax and restore the brittlest of minds. But Gracie has another reason for visiting Catello Montefesco. Once a talented artist, she lived near the castle, apprenticed to her uncle Hans who taught her all he knew about art. Gradually she confides her past to her granddaughter, and a story emerges of forbidden love, secret passions, deception and ultimately, a betrayal for which Gracie has always blamed herself. But the castello works it magic and as the week goes on, the three women find a rare peace and contentment. Gracie gradually comes to terms with her demons, Anastasia finds romance with a handsome Italian gardener and Carina discovers friendship, the art of relaxation and the surprising revelation that carbs won’t kill her! But most of all, they find their bonds strengthened as Gracie’s secrets spill out. And as she comes to terms with the past, she has many decisions to make – not least whether to return to Badley Compton and live out her days under the patronage of Flappy, or pursue new happiness elsewhere. 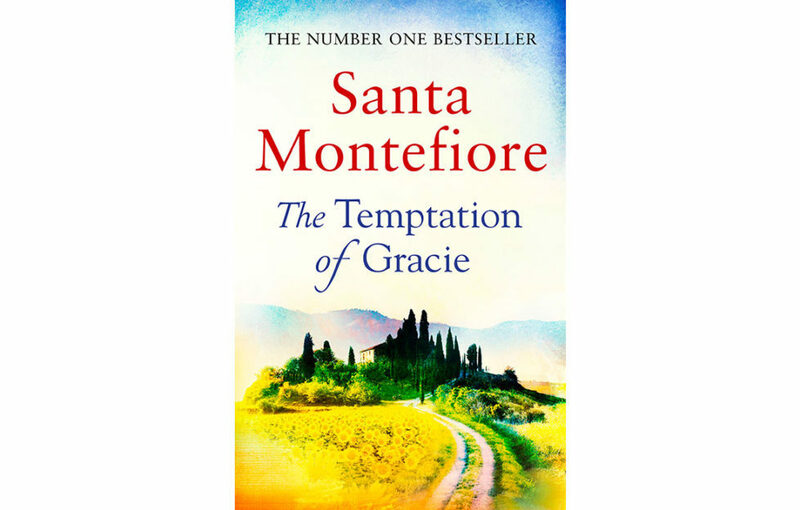 This story from Santa Montefiore ticks all the boxes. There’s romance, intrigue, friendship, family bonds – all gloriously played out under a Tuscan sky. One can almost smell the bougainvillea wafting from the pages of the book as you turn them eagerly to discover what’s in store for these three strong, sympathetic woman. And what of Flappy Scott-Booth back in England? She’s a delight. She’s the author’s answer to E.F. Benson’s Lucia, while Badley Compton could well be mistaken for a 21st century version of Tilling. I’d gladly read a whole book devoted to her and her well-meant if snobby ways. Let’s hope Santa is keeping that one up her sleeve – meanwhile sit back and enjoy The Temptation of Gracie.